I thought about it and thought about it and then got the Z06 Overkill poster other day and there it was, my car with no BSM's. They had to go. I stopped by a body shop and he told me $50 bucks to take em' off. He grabbed the right short one and it nearly came off in his hands so I thought, heck I will save that money and do it myself. Stopped by the local small parts store to price some adhesive remover and it was $23 bucks (read small town parts house). I looked on the ingredients and it said Xylene blah, blah, blah. Well we use Xylene at work all the time and I had some at home so passed on the $23 dollar deal. Got home and dug in the tackle box and found some 30# fishing line and went to work. I sawed about a 12" worth and then just pulled them off slowly. Hit them with the Xylene and let it set and then started rolling up the glue.......HOLY NO FINGER PRINTS BATMAN! First side wasnt bad but the second side was suckin. I ended up wrapping a microfiber towel around my point finger and hitting the glue at a downward angle instead of straight on and it came off ALOT easier. Hit it with more Xylene and softened it up more but still left a dirty streaks around the perimeter where the glue was and the Xylene wasnt really cutting it.....? Tried some spray on glass cleaner and it cut it instantly. All in all Im happy with the look of it....reminds me of looking at the bottom side of a stingray when they open there gills or mouth or whatever it is. Was it worth saving $50 bucks? Not at the time but now that its over it is. Thanks for the write-up. I'm going to remove mine, also, even though I really like the way they look, and they are functional, too. I'm getting some custom paint work done around the coves, so they have to go. I'm going to remove the rear C5 logo, too. My buddy's going to do some small "real fire" flames, and perhaps paint on the ZO6 logo with "Supercharged" on it. I already have custom badges that say 525 HP, and it needs substantial updating. So, I guess i'm going to have to remove those, too. Interesting combo of materials. I used the #30 line also, but held the hair dryer on the BSM for a few minutes before "fishing" - seemed to soften it up a bit. I also loaded it with WD40 as I was "fishing" - that seemed to help, too. Between the WD40 and the "Goo-Gone" - the project cleaned up beautifully - I found somebody to buy the BSM's - and I LOVED the look without them! I've had 2 C5's and neither one of them had BSM's which was fine by me! When I bought my C5 in '09, a '02 metallic pewter coupe, the body side moldings were way down on my list of options. As I started paying more attention to C5's I encountered and checking out their wheels, exhaust, etc. my car was obviously missing something: body side moldings. I was able to buy a set shipped to my home from a forum member for $100 versus the $300+ from GM. After dealing with the half of the tape remaining on the moldings, buying paint and clear coat and the "professional" 3M double sided tape, I ended up spending a couple of hundred bucks to gain the $75 option that was so obviously missing. My advice, they don't take up a lot of space so keep them for the next owner. I've thought about removing mine but being a '98 and our daily driver I think they will stay on for a little longer. 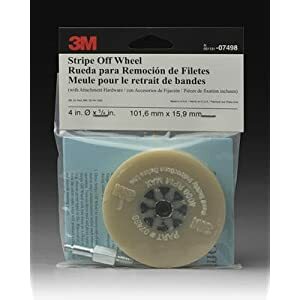 Not sure if anyone has heard of this (see pic) but I just ordered one to remove pinstripes from my tbss. I will also use it when I remove my rear emblem. I'll let you know how it works. $31 shipped from ebay. Congrats on getting the BSMs off - hope the fingers recover soon. I used a pair of water ski gloves, made of shark skin. Congrats to the OP for removing the BSM. I did mine.......love it much better. And I hope zeevette plans on posting pics of his custom work. I would love to see it. I hate that job. The stripe removal tools work great on pinstripes, not so great on the foam tape. I have one that is a solid wheel. I think it's called The Eraser. It lasts better than the 3M deal. Plus everything 3m sells is a fortune. Meanwhile the insurance companies give you something like .2hr to remove, cleanup and reinstall a mldg. Most of them have wised up and just pay for new mouldings. But you still got to get the old crap off. All you need is a can of WD-40, some fishing line and a half of an old credit card. The WD-40 is an excellent and VERY safe solvent on any type of automotive paint, IE: clear-coat. and a plastic credit card is a fantastic scraper which won't harm you paint one bit. A year or so ago I ran across a freshly painted, but unmarked yellow street line. I have a 2003 50th Anniversary coupe, so you can imagine what very bright yellow speckles look like against the metallic red paint. I got a long section of cardboard, laid on my side and sprayed down the whole area and after the second coat of WD-40 I started in with the old credit card. Took close to two and a half hours, but the WD-40 and the plastic scraper finally got the last of a thousand yellow speckles to pop off. I finished it up with a total washing of the car and re-applied a new coat of wax. Today you can't tell where the paint was at all. I removed mine a month or two ago and I love it. I didn't mind them until I made grills to put in the side coves and the BSM just covered it up. I love the way the car looks now. Last edited by road dog; 07-14-2011 at 02:42 PM. Thats pretty damn slick my friend......plus its silver. Its actually gutter guard from Home Depot that I sprayed with a clear enamal to protect it. How did you attach it.....2 sided tape?? I cut the edges into tabs and folded them around the cove opening and then I used epoxy to glue them to the inside of the fender. Quick Reply: Removed BSM's.....Needing Fingerprints!! !